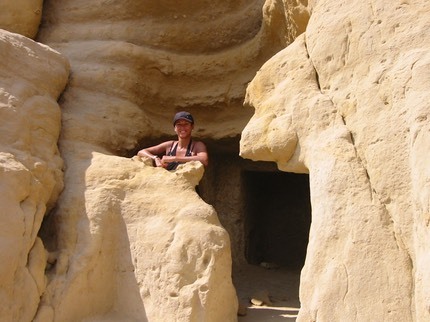 Jonna has visited many of the Greek Islands. Skiathos gets the 'best island' award. Beware of the fat naked Germans on the beaches. September 2007 saw us rushing for some sun after a dreadful English Summer. 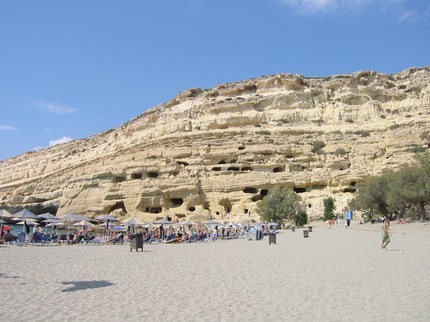 We chose Crete and Matala, a really quiet town/village on the south coast. It was briefly famous as a hippy hangout in the sixties although some have remained. I hired a car for some birdwatching, but it was so hot that I didn't last long. I shopped at a LIDL on the way back to the apartment. (A new experience). The apartment we had faced up a gorge and every evening we had huge flocks of Alpine Swifts screaming up and down the gorge.